Spectroscopy is one of the standard experiments in atomic physics courses. 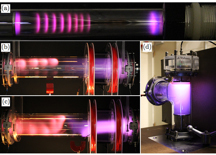 It is also one of the methods of evaluating plasma parameters such as electron density and temperature. An analysis of dc glow optical emission is readily accessible to undergraduate students. In a dc glow discharge, light is typically emitted by neutral atoms that are excited by electron collisions. If we further assume that electrons collide with atoms in their ground states, then the distribution of the excited levels depends on the electron energy distribution. Experimentally observed line intensities are therefore related to the electron energy, and therefore the observed intensities can be used to estimate the electron temperature of the plasma (under the assumption that the electrons follow a Maxwell-Boltzmann distribution). We use a survey spectrometer for a broad spectrum of argon in a dc glow discharge and a higher resolution instrument with a high enough spectral resolution to distinguish individual lines which are used to infer the electron temperature via a Boltzmann-type plot. This Immersion will be 3 days long. Over the first two days, we will cover the basics physics behind the plasma source, vacuum techniques, calibration of the diagnostics, data acquisition and analysis, as well as all safety aspects of the device. During this time, participants will assemble a working dc discharge plasma from the ground up and then got through all aspects of measuring and analyzing emission spectra from several gases as well as calculating the electron temperature from the spectra. The third day will provide participants the opportunity to focus on a problem of specific interest and/or to connect with one of the other concurrent ALPhA immersions at PPPL. We have several versions of this plasma source, the simplest costs only $2K, the largest approximately $10K which assumes that participants do not have any equipment available for use at their home laboratory. A full parts list will be available so that participants can easily recreate the laboratory setup at their home institution. The survey spectrometer is approximately $3,000 and the high resolution spectrometer is approximately $10,000.